Okay, so I have a client that wants a 8x10 deck built at ground level to put his grill on. Problem is, the ground tends to pool water whenever it rains. It's a part of an overall problem with the grading of the soil behind his house. It's just a natural low spot. He has investigated having some remediation done, but there are a lot of houses and outbuildings, etc. involved, as it affects most of the backyards on his side of the street. What's the best way to anchor this deck? Treated posts will tend to rot prematurely in this soil, so I am thinking concrete posts. Is there a better solution? 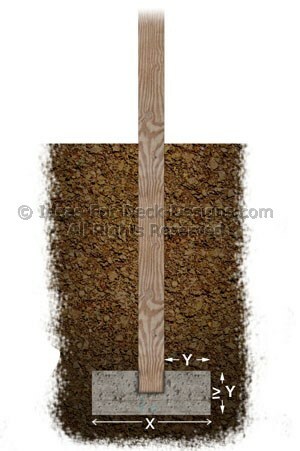 When you are building a deck on soggy ground or wet ground the first thing to rule out is using treated posts as support posts sunk into the soil whether or not you surround them in gravel or pour concrete around them. Both materials are porous and the posts will have a much shorter life cycle. However, you might want to investigate using some of the expanding foam products as they are sometimes completely impervious to water. You would still have to make sure the bottom of the post is also covered in the foam as well. This is a bit of a wild card and I would put your focus on a traditional concrete pier with a broad footing set down a good 3' below grade or to whatever depth your frost line is. Engineered helical piers are an expensive solution but they are very effective in a situation like yours. They can be driven down very deeply depending on the soil type and any water that is pooling above would be irrelevant. Let's go back to the remediation issue. If that can be done without a lot of money there could be a few options for footings. Bringing in a load of stone dust, finely crushed stone and grading the area so that the elevation is now a couple inches above the water line might be enough to allow you to use a simple concrete deck block footing. These are not the finest solution but they are inexpensive, so it will depend on your budget. For a step up from a concrete block system and an overall better aesthetic look, you could use the Titan Deck Foot Anchor as the load plate would now be distributing compression load to the stone dust below which is now a couple inches above the water line and it would be anchored firmly in the soil. Both of these suggestions are only for free standing or floating decks, not ledger attached so there might be some very slight annual movement of the deck relative to the house from winter to summer. Building a deck on soggy ground is problematic but not impossible to do. So keep these tips in mind. 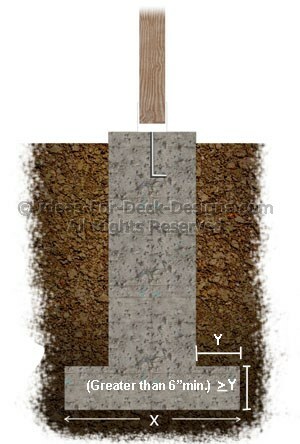 For a really good refresher on the various traditional footing systems be sure to read this article on deck foundations. Nothing is mentioned about checking local building codes in this article, so just be sure to always do that. Nowadays, the deck building requirements are much more strict than those of decades past, and I was suprised of some of the specifics, even down to specific brackets and screws, etc, are required by code. One option not mentioned is marine grade treated lumber. This lumber is used for building docks, and is designed to be constantly under water, even saltwater. Great tip! This is essential in a wet environment.